The tweet pointing out the error in the book, Congo Stories. A new book about the Democratic Republic of Congo has come in for some unwanted attention on Twitter. It has been pointed out that the book features a map of the other Congo - the Republic of the Congo. 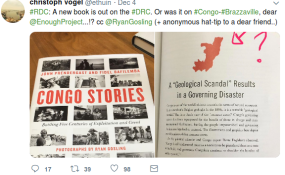 The book - Congo Stories: Battling Five Centuries of Exploitation and Greed - is by Enough Project Founding Director John Prendergast and Congolese activist Fidel Bafilemba, with photographs by actor Ryan Gosling. It's getting a lot of high-level attention, and has been promoted by actress Robin Wright and by Susan Rice, national security adviser to President Barack Obama, who said on Twitter: "Great book. Buy now!" Was a designer error that's being corrected (thx for pointing out), but it's clear that the book is about #DRC Congo. It profiles heroic Congolese activists & upstanders and gives them a chance to tell their important stories that the world needs to hear @Soraziz. The description of the book on its website says that Americans and Europeans have benefited enormously from an astonishing history of exploitation of the people and natural resources of a country in the heart of Africa. "The people of Congo are fighting back, risking their lives to resist and alter the deadly status quo. And human rights movements led by young people in the U.S. and Europe are supporting those Congolese change-makers. As a result, the way the world deals with Congo is finally changing. "Fidel Bafilemba, Ryan Gosling and John Prendergast traveled to Congo in order to better understand that history and to document stories of Congolese upstanders who are building a better future for their country, and young Congolese overcoming enormous odds just to go to school and care for their families. "Through Gosling's photographs of Congolese daily life, Bafilemba's profiles of heroic Congolese activists, and Prendergast's narratives of the extraordinary history and evolving social movements that directly link Congo with the United States and Europe, CONGO STORIES provides windows into the history, the people, the challenges, the possibilities, and the movements that are impacting the course of Congo's destiny." At allAfrica, we know the difference! Check out our Congo-Kinshasa (the DRC) and Congo-Brazzaville (the Republic of Congo) pages for all the news you need about these two countries.